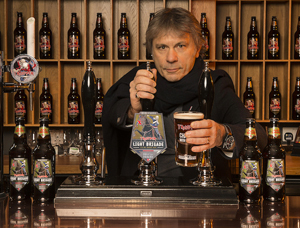 ROBINSONS, IRON MAIDEN And HELP FOR HEROES Join Forces To Launch LIGHT BRIGADE Beer In The U.K.
HELP FOR HEROES met with ROBINSONS in the summer of 2017 to explore the possibility of launching a beer. ROBINSONS and IRON MAIDEN, who jointly launched TROOPER Beer almost five years ago and which has now sold over 20 million pints worldwide, were immediately enthusiastic about the idea. Indeed, the origin of TROOPER’s name, which comes from the classic IRON MAIDEN song, "The Trooper", based on the Battle of Balaclava of 1854 in the Crimean War, reflects the band’s well-known interest in history. BRUCE DICKINSON said: “We are very proud to have been asked to get involved. I have been an instructor on several of British Airways’ flight simulator ‘Flying Heroes’ days for HELP FOR HEROES Veterans, so I know the charity and the work that they do well. LIGHT BRIGADE is our interpretation of a golden ale that maintains the elements of strength and character that are the essence of TROOPER but at a more sessionable level. In fact, the two beers complement each other very well." LIGHT BRIGADE is designed as a session ale for beer and music fans everywhere. It will also be produced on a long-term basis, differentiating it from the other limited edition TROOPER beers: 666, Red ‘N Black, and Hallowed. 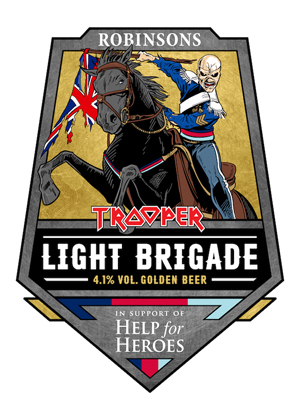 In keeping with the Trooper brand, LIGHT BRIGADE’s original bottle label features IRON MAIDEN’s iconic mascot EDDIE on horseback in one of the uniforms of the LIGHT BRIGADE. LIGHT BRIGADE is available to pre-order online now at www.robinsonsbrewery.com for delivery from February 1st. It will be stocked in supermarkets nationwide and selected pubs from February 19th onwards. For more information on ROBINSONS Brewery, please visit www.robinsonsbrewery.com, like them on Facebook: www.facebook.com/robinsonsbrewery, follow them on Twitter: www.twitter.com/robbiesbrewery (@robbiesbrewery) and on Instagram:www.instagram.com/robinsonsbrewery.